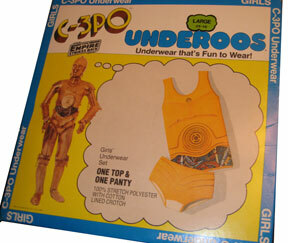 I had many pair of underoos growing up. My top two faves were my Wonder Woman set (my first pair) and my C-3PO set. Thanks to the wonderful world of eBay I was able to locate a couple sets. 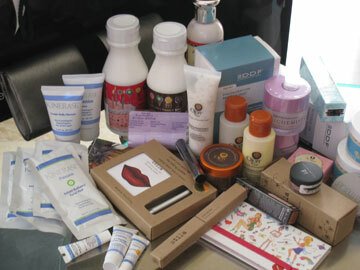 After opening the package, I suddenly remember the 70's world of polyester all over again. 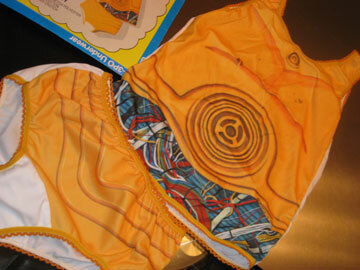 Also I still laugh that only the fronts of the girls underoos are printed, and that the backsides are white. 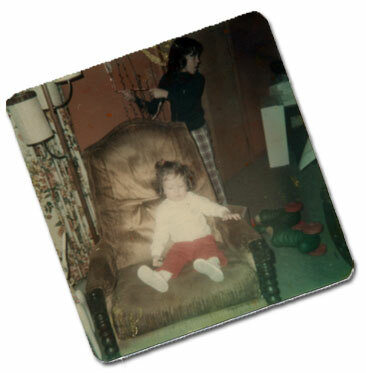 This is my cousin Mike to my right and mini-me circa 1977. 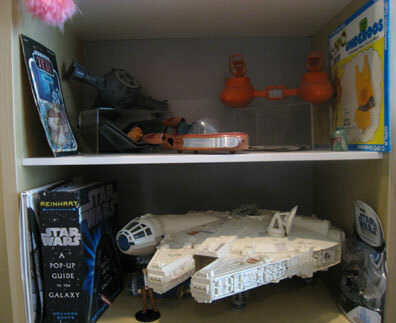 Mike had the best BOY toys growing up. Being three years younger than Mike, I was all about his business when he would visit, especillay his AWESOME Star Wars toys. Fast forward 30 years... We are enjoying dinner with Mike's parents (Larry and Esther) at the Scottsdale Cheesecake Factory. And I mentioned how I would follow Mike around and he would sometimes let me play with his toys. Though I love monkeys, owls come in at a close second. I just scored the owl sake cup at Anthropologie this weekend. So taking few things from my craft desk area, I payed a little homage to my owl collection. 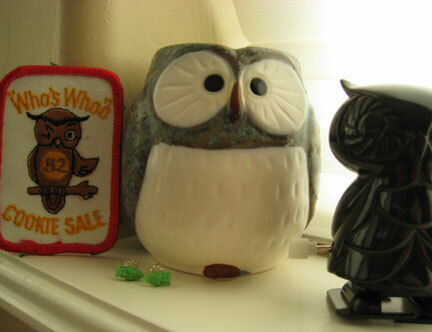 Check out the throw back 82 patch-- the whos' whoo in 82 was one of the best Girl Scout cookie campaigns (I still have all my patches)-- and remember BUBO the owl from Clash of the Titans? I wanted (and still do) my own Bubo! 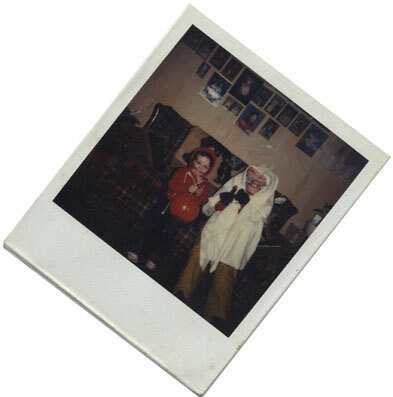 This is me (as E.T., note the bedsheet just like the movie, and the ad-hoc work glove with a yellow paint dip) and April (my sister-- its her first Halloween- she didn't want a costume, so I painted whiskers on her) For all those 70s/80s kids, remember how breathable those plastic masks were? Hope you are enjoying your candy hangovers today! Thanks for the AWESOME comments and emails. There is still one more day to enter... so take a break from that TiVo'd 90201 premiere you recorded last night to say hi!--- OMG... speaking of 90201... love it. 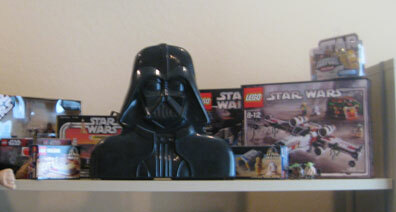 Ahhhhh nothing like some childhood toy goodness. 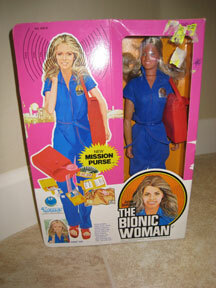 Let me introduce...the Bionic Woman (aka Jaime Sommers). Though she was too tall to roll with Barbie (and her teeny tiny clothes and elf-like shoes), it didnt' keep her from stealin' Ken away. I don't think it bothered Jaime that she was tall. Jaime is a special breed 12 inch dolly with man-sized flat feet, and she wasn't afraid to sport the wedge red sandals and sassy blue jumpsuit-- with logo! 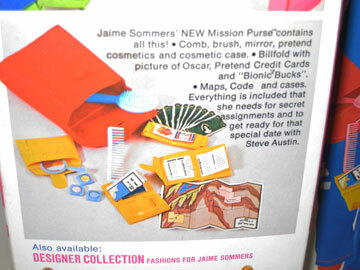 I like that they point out that the credit cards are pretend.-- And what gal doesn't have a pic of OSCAR in her billfold.-- And don't forget that makeup for that special date with Steve. By far the purse is the BEST part of this set. 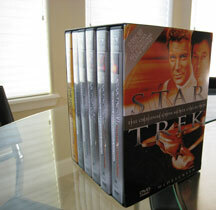 To add to my collection of childhood memories, I was able to pick up this box set of all 6 original crew Star Trek movies...including my favorite one... Wrath of Khan (Star Trek II)! Hearing the SHAT yell KHAN! is one of the most memorable lines in cinema. I am a huge William Shatner fan! Its hard to believe that first film came out in 1979. I can remeber going to the movies around Christmas time of 1979 with my dad to see the first movie...and at the time I didn't think it was as cool as Star Wars. As an adult, I love Star Trek and remember watching reruns Sunday evenings growing up--- it was on right before the Muppet Show. 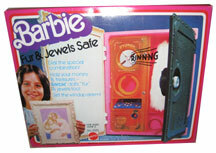 This is the Barbie Jewels Safe circa 1978. 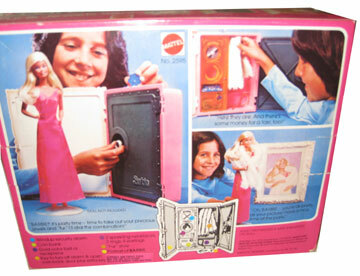 This was the ULTIMATE ritzy showpiece for Barbie. Note it holds her JEWELS and FURS ( you know before FUR was politically incorrect and we had no idea about baby seals-- and we all had white bunny coats back then--). It also doubles as a bank! Note the FINE artwork that fools all potential burgulars into thinking it's just a piece of art. 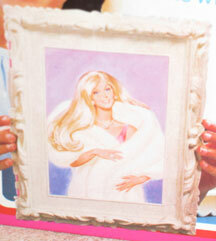 There is something oh so DALLAS- esque about that painting of Barbie-- very Sue Ellen-like, and the frame is oh so fancy. We used to also pretend to play one of the Price is Right 'pricing games-- safe crackers where Barbie could win just like the people on TV-- man I miss Bob Barker!!! 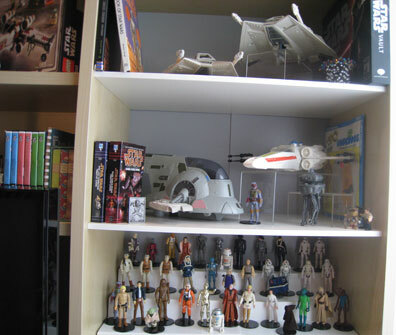 Over the past month I have acquired some new goodies for the toy collection, so I will be posting pics! I was able to find some HTF circa 70s toys still in the box :) thank you eBay. Today lets take a trip down memory lane with Little People. 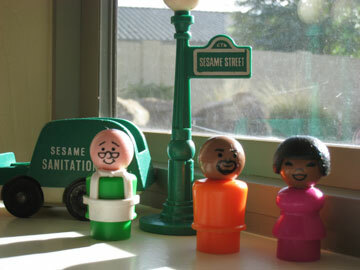 Here we have Mr. Hooper, Gordon and Susan. I laugh everytime I look at Gordon's goatee-- very progressive for Little People design. 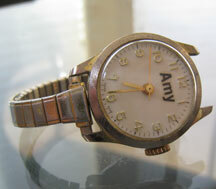 So yes even 30 years later the new Bionic Woman rocks! With bonus BSG starbuck and chief sightings... I am definitely double dipping in the show! also note all the crappy easter baskets in the background. 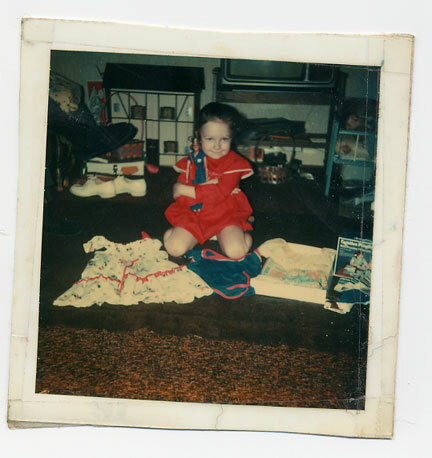 My birthday would always fall around or on Easter-- the worst was when the easter basket "counted" as my birthday gift... what the hell!